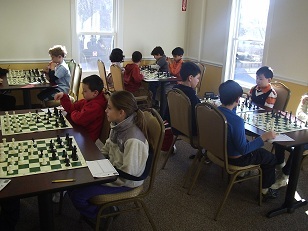 As is now the norm, the K-5 Scholastic Championships continues to grow! This month nearly 30 students participated. The winner of the K-2 section was CCFC student Samuel Forfang who yielded only one draw to Dream Teamer Mikey Lau. There was an impressive tie for 2nd – 5th place. Mikey Lau, Sean Thomas, Benjamin Filler and Dalton Brown all finished with 3 points! In the 3rd – 5th grade section, Brandon Wang impressed with a perfect score! Brandon defeated many strong players on his way to victory, including the always dangerous Leo Koganov and top seeded Henry Stratakis-Allen! This section also had a large tie for 2nd – 5th place between Henry Stratakis-Allen, Frank Drugge, Matthew Lutjen Weinstock, and Eric Stein. Congratulation to all of the winners and we look forward to seeing you at our next K-5 Scholastic on March 18th!